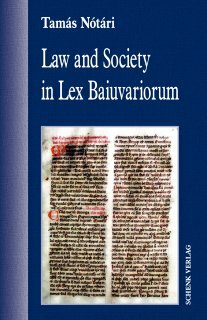 Lex Baiuvariorum is Bavaria’s most important and earliest source in terms of legal history. This monograph intends to give in-depth investigation of certain legal and social history aspects of Lex Baiuvariorum, at the same time dedicating ample room—as it is made absolutely necessary by the subject—to Medieval Latin philological analysis as well. The first chapter, on the one hand, examines the history and society of Bavaria in the first half of the 8th c.; more specifically, dwells on Bavarian home and foreign affairs, development of the Bavarian church organisation, certain issues of the structure of society, namely, evolution of the Bavarian nobility and the status of freemen and slaves; on the other hand, analyses termination of the independent Bavarian Dukedom focusing on the dethronement of Tasilo III, the last duke of the Agilolfing dynasty and the legal background of dethronement. The second chapter deals with the history of the creation of Lex Baiuvariorum; more specifically, dwells on the issues of dating of Lex Baiuvariorum, possible connections between the content of the narrative in the Prologus and the process of making the code of laws, significance of the first two titles of the code in terms of dating and problems arising with regard to the process of editing Lex Baiuvariorum. The third chapter discusses the private and criminal law of Lex Baiuvariorum. The fourth chapter that analyses the language, sources and impact of Lex Baiuvariorum can be divided into the following parts. The subchapter discussing the German linguistic elements of the code focuses on the issues set out below: the general characteristics of the German phrases of Lex Baiuvariorum, the problems of the ex asse Bavarian phrases of the text of the code, expressions corresponding to Lex Alamannorum and terms that can be presumed to be of Bavarian origin. In the analysis of use of sources by the compilers of Lex Baiuvariorum it touches on the problems of possible secular and ecclesiastical sources of the code, Visigothic impact and the relation to Alemannian laws. From the history of the impact produced by Lex Baiuvariorum one circumstance is chosen: the influence exerted by the Bavarian lex on the laws of the first King of Hungary, Stephen I.